MELISMATIC: Back In the Day: PYT, Are You Still Down For Me? Back In the Day: PYT, Are You Still Down For Me? With the influx of new girl groups starting to pour out onto the ether, I am drawn to ten years prior, a time when, like now, pop groups were a dime a dozen and seemed to be arriving at an astonishing rate. We now live in a music world forever changed by illegal downloading and MySpace Profiles, but just ten short years ago, so much was different, and yet so much was the same. So I present to you, a special girl group edition of 'Back In the Day'. For fans of pop girl groups, the most famous American groups that came out of the 1990s/2000s group were Destiny's Child and Dream. However, there was one girl group who I for one adored since day one, yet never got to realize their true potential, due to stupidity in the label's marketing department, in-fighting, and the ever-popular delay delay delays. PYT (who's name was never truly confirmed, as in the beginning, it stood for "Prove Yourself True", and as the years wore on, took on the obvious reference from the Michael Jackson song, "Pretty Young Thing") was a four piece girl group (in the picture to the right: upside down left to right -- Tracy Williams, Ashley Niven; right side up left to right -- Lauren Mayhew, Lydia Bell; back in 1999) signed to Epic Records in the late 1990's/early 2000's, and released their debut album, PYT (Down With Me) in mid-2001. The group was made up of teenage friends from Tampa, FL, and they won their deal with Epic after reading about a contest for singers in a teen magazine. They were managed for a time by super-pop-manager Johnny Wright, and had opened for *NSYNC, Britney Spears, 98 Degrees and Destiny's Child, as well as appearing in labelmate Mandy Moore's debut music video for "Candy." The group "released" three "first" singles (the very poppy "Something More Beautiful", the more urban "PYT (Down With Me)" -- the above music video -- and the hip hop tingled "Same Ol' Same Ol'" -- which was the debut of Epic's then new artist, Sarai) before the album dropped in August of 2001. Shortly thereafter, the group was dropped from the Epic Records roster due to slow sales and the four members friendship clearly started to disintegrate. For more info, watch their label-produced EPK for the specifics. Rumors began to circulate of Lydia Bell and Lauren Mayhew being asked to leave by the label, that Ashley Niven was approached with various solo deals, and that Tracy Williams was offered to join a new girl group. No one knows the real story except the girls themselves, and I am not one to speculate on this matter, as this group is very dear to me. What did happen however was that Tracy joined/formed a new more dance/hip hop inspired girl group. Ashley pursued college, and has only recently gotten back into pursuing music. Lauren went down the acting road, as well as attending college in California. She released a solo album in 2006. I'm unsure what Lydia Bell has been up to -- if she has a music page, I cannot find it. I do know she has ditched her cutesy long blonde hair look in favor of a more reddish, shorter, La Roux type style. **Update**: Thanks to Lydia herself, I can tell you she is still pursuing music, but more of the jazz vein, as well as theater. Ashley Niven (in the pic below, all the way to the left) was the undisputed lead singer of PYT with a voice that then, at the ages of 13-15, knocked your socks off. 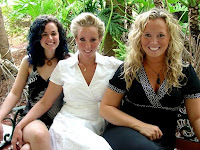 She joined a new Christian inspired band with two other young women entitled Encore. The MySpace hasn't been updated since mid-2008, but take a listen to hear how incredible they sound acapella. If you listen to "Christmas Medley Part 1", the second voice you hear around the :13 mark ("Hearts unfold like flowers...") is most definitely Ms. Niven. Tracy Williams was one of the alto singers of the group, went on to form her own girl group, UC3. After they disbanded, I'm guessing in late 2007, she began working on solo work. You can follow her on Twitter, or check out her solo tunes on MySpace. She signed up with Universal (specific label unknown), and dropped a rhythmic single in the summer of 2008 dubbed "Instant Gratification". Her most recent single is called "Diva" (woot! ), and it's available on iTunes. "Can you keep up with Ms. Tracy Williams?" It reminds me of a lighter, poppier version of Jessi Malay's "Topsy Turvy". Post PYT, Lauren and fellow group member Lydia Bell formed a group called Turning Point, but that fell through, and both went their seperate ways. Lauren rarely had solos in the group, but due to her curly hair and sparkly demeanor, she was always my personal favorite. She was more of the actress of the group, with a recurring role on the soap opera "Guiding Light" long before PYT took proper flight. You can also follow her on Twitter. Her solo project is more my speed than Tracy's -- it's a rock, pop, electro-y fusion via a full album independantly (released on iTunes back in 2006) entitled Mayhem, a play on her last name. She has since gone quite blonde, and tends to straighten her hair (boo! we were twins!). However, I dig she really went for it, considering she was more of a background singer in PYT, so as she says in "Buckle Up": "It's gonna be about me/Buckle up now/I'll take the world by storm." Check it all out at her MySpace. To this day, PYT (Down With Me) is still a fun record for me to dance to and reminisce, and it's a true crying shame that they weren't launched properly and it all fell apart. It was because of these girls, who are my age or a little bit older, than helped inspire me to pursue a career in the music business. My first venture into web design/blogging was via a fansite for them (not to toot my own horn, but it was one of the more popular ones for them). I'm happy that for the most part, they are still pursuing it -- but now, I can really appreciate how much they were given at such a young age. Q Magazine? Que chic! Thank you! :) Me too -- And it kind of freaks me out that there are already where-are-they-nows in my music history. Heh. I adored PYT back then and was so sad they broke up :( Thanks a lot for the update. I'm glad to hear what the girls are up to. I am fan of your site. I love to read to a new post. Great blog post! You should check out what Ashley Niven is up to these days, making great music in Denver!